The target: A major bridge over the Po River near Pavia in northern Italy used by the Germans in World War II to move men and equipment south to the front line. The mission: 50 B-26 “Marauder,” twin-engine, attack bombers struck the span. Each carried four 1,000 pound high explosive bombs. For leading the flight of “Marauders,” even though he was almost shot down, Capt. Stanley Ackerman of Venice, Fla. received the Distinguished Flying Cross. The medal is America’s oldest military aviation award. Their bomb group provided tactical air support to Gen. Mark Clark’s 5th Army and the British 8th Army both in Italy. Their “Marauders” were often called in to bomb enemy-held bridges and fortifications. Flying from a base in Sardinia Ackerman’s 320th Bomb Group hit the Po River bridge. They were sitting ducks flying at 12,000 feet over the German radar-controlled anti-aircraft guns proteting the bridge. “The Heavies,” the B-17, B-24 and B-25 bombers, flew at twice that altitude to bomb their targets. “I was leading the group to the target when I took a hit from enemy flak and my rudder jammed. The group followed me and we missed the target,” he explained 70 years later. “After I got the rudder cables unjammed we did a 180 degree turn 10-miles out, came back over the target and took it out. Mission completed! By far his most famous bombing mission was the one his group made to knock out the railroad yard at Florence, Italy. Florence, “The Jewel of the Renaissance,” was declared an open city. Meaning both sides agreed not to bomb it or fire their artillery into the city. But the railroad yard, on the city’s outskirts, was fair game. Ackerman and the 320th Bomb Group of the 12th Air Force was given the task of destroying the switching yard used by the Germans. “The Heavies” flew at 20,000 feet or higher when they bombed and lacked accuracy at that altitude,” according to Ackerman. The only thing they were good for was saturation bombing. 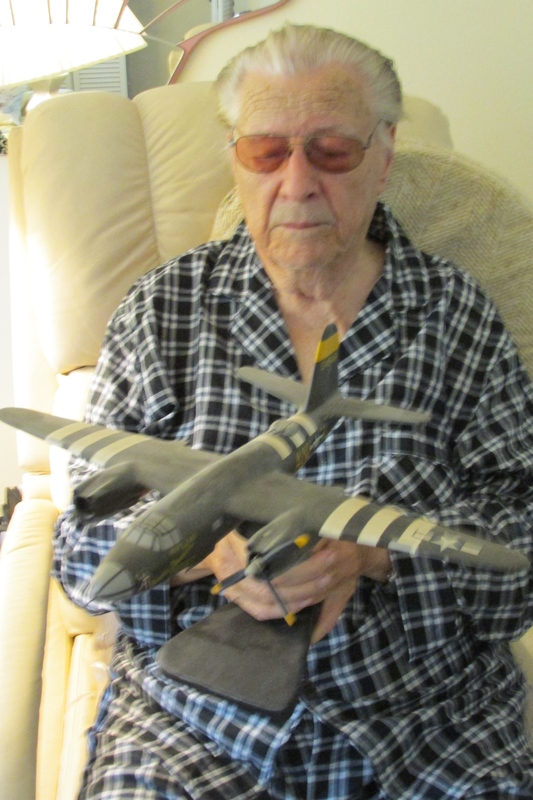 His B-26 “Marauders” bombed at 12,000 feet and most of the time they were dead on the target, he said. “We did a nice job bombing the railroad yard at Florence. A short time later my colonel called me up and told me the general wanted to get some publicity on the job we did on the yard. Mack, my bombardier and I, were sent to the palace in Casserta, Italy to meet the general,” Ackerman recalled. The man in charge was Lt. Gen. Ira C. Eaker, commanding general of the 12th Air Force. He commanded the Mediterranean Theater of Operations with 1,500 aircraft at his command. Mack was a frustrated writer and a 1936 Princeton graduate. He spoke French fluently and knew all about Western Civilization. He was well- qualified to write the story, according to Ackerman. “We got as far as Pisa by air, but had to take a Jeep and drive to Florence through the British 8th Army lines. When we reached Florence we weren’t greeted with enthusiasm by the commanding British general,” he recalled. Round-aboutly Ackerman and McCartney got a bunch of pictures of Florence thanks to their unnamed sergeant who went with them to capture the scene. The trio returned to the American Embassy in Rome. Mack started writing his story at the embassy. A week later he turned the manuscript over to Gen. Eaker. It was much more than a story on their railroad yard bombing raid. It was a 40-page piece that covered what had happened to Florence during the war. The general gave the package–story and pictures–to the War Department. Months later it appeared as the lead story in the March 1945 National Geographic Magazine. On Page 293 is a picture of Ackerman and Mack standing in the rubble of the railroad yard looking at a map of the city. There are other pictures of the two officers accompanying the article. “The day after Lt. Benjamin C. Mc Cartney’s manuscript was received by the National Geographic Magazine, the gallant young aviator’s death from wounds received in action over Italy was announced by the War Department. “One of the reasons we were stuck in Sardinia so long is that they were hung up about bombing the abby at Monte Casino,” he said. “Our B-26 ‘Marauders’ were the last flight to bomb the abbey. “I’m an Episcopalian, but I felt sad we bombed the monastery. By the time we flew over the abbey the B-17s, 24s and 25s had turned the place to rubble. Our bombs were right on target, too. During the summer of 1944 not only was the Normandy Invasion planned, but the Allies also stormed the beaches of Souther France on Aug. 15th. Ackerman and the 320th Bomb Group were involved in that invasion. By December 1944, Capt. 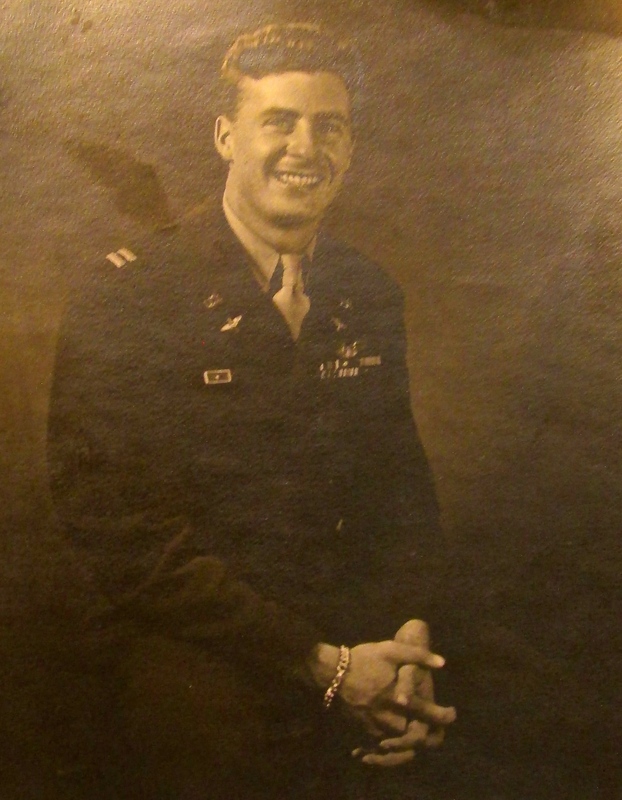 Stanley Ackerman had flown 66 combat missions over Western Europe. He had accumulated enough points to return home. The returning aviator spent his first month on leave partying back home in New York City where he was born. Then he was sent to Lubbock, Texas to serve as an Air Force instrument panel instructor for the remainder of the war. That’s were he was discharged from. Ackerman took the G.I. Bill, returned to engineering school and got his degree. His first civilian job was working for Goss Press Co. in Chicago as a design engineer. He did that for a few years until he realized there wasn’t a lot of money in engineering. The money was in sales. So he went to work in 1954 as a salesman for a company that made gold stamped book covers. Years later he purchased a quarter-interest in another company and remained with them into his ’70s. He never married, “but I had a lot of girlfriends.” Ackerman retired to Venice in 2011 in his 90s. He is 96 and still going strong. by directions of the President under the provisions of Army Regulation 600-45 as amended, and pursuant to authority vested in me by the Commanding General, Mediterranean Theater of Operations. For extraordinary achievement while participating in aerial flight as pilot of a B-26 type aircraft, on 5 September 1944, Captain Ackerman led a large formation in an attack upon a road bridge at Pavia, Italy. Upon the approach to the target, shell figments from intense anti-aircraft fire heavily damaged Captain Ackerman’s airplane and rocked it from his control. Displaying great courage and resourceful leadership in the face of the continual barrage, Captain Ackerman quickly regained control of his crippled plane and maneuvered it back into the lead position. Then guided his bombers on a perfect run over the objective, Captain Ackerman enabled him to score many direct hits, destroying the bridge and hereby blocking a vital link in enemy communication lines. Leading a vigorous evasion mission against heavy ground fire, Captain Ackerman returned his B-26s safely to base. On more than 55 combat missions his outstanding proficiency and steadfast devotion to duty have reflected great credit upon himself and the Armed Forces of he United States. This story was first published in the Charlotte Sun newspaper, Port Charlotte, Fla. on June 29, 2015 and is republished with permission. Click here to view Ackerman’s collection in the Library of Congress. Today, Tpr. Jeffrey Burke and Tpr. John Driscoll, of the Troop B Community Action Team, along with Tpr. First Class Henry Arroyo and Tpr. First Class Paul Dacruz of the Connecticut State Police, as well as the United States Marine Corps honor guard from Westover Air Reserve Base, had the honor and privilege to welcome home USMC Captain Richard W. Vincent. Captain Vincent was listed as killed in action (KIA) in Tarawa on November 20, 1943, although his body was never recovered. Missing for almost 71 years, his remains were uncovered on October 21, 2014 during a construction project on the island. His dog tags and DNA testing confirmed his identity, and he has finally returned home today. Captain Vincent was flown into Bradley International Airport, and was escorted to his home of Westfield, MA. He will be laid to rest on Thursday with full military honors. Captain Vincent was a lieutenant with D Company, 2nd Battalion, 18th Marines, 2nd Marine Division, and was posthumously promoted to captain.